Our Original Meal Plan offers 1 week of Freezer Meals in just one hour. This is perfect for pulling together all your meals on a Saturday morning or Sunday afternoon so you're ready for the week to come. We normally eat out or eat leftovers one night so this meal plan includes 6 Recipes. That’s a total of 6 Freezer Meals and you can make everything in about an hour including cooking the Beef and Chicken. My goal with this meal plan was to provide you something you can do on a weekend to help you get ready for a busy week ahead. You can shop for this meal plan and assemble easily on a weekend or week night then you’ll have your Freezer Stocked for all those busy nights when you need to have Dinner ready when you get home! 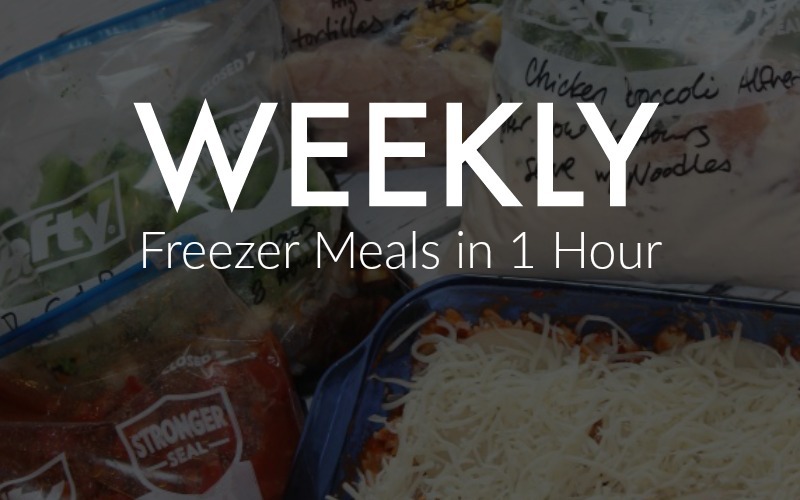 You can make 1 Week of Freezer Meals in just about an Hour! This simple plan is perfect for putting together on a Saturday Morning or Sunday Afternoon as you prepare for your week! You'll have a meal in the Freezer for dinner each night making it the Perfect Sanity Saver and the best part is it doesn't require a lot of time up front!